While elk may have roamed the greenery of Golden Gate Park at one time (along with many other exotic animals), the four-legged creature is no longer a resident of the park. Instead, you’ll find the sights and sounds of a quiet Elk Glen Lake, which is situated in the middle section of the park. With plenty of trees to provide shaded comfort and an inviting landscape that attracts local wildlife, a visit to the lake can prove a worthwhile way to spend quality ‘me’ time in the park. 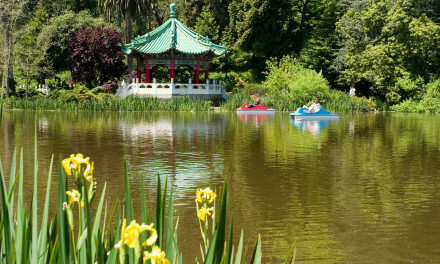 Since Elk Glen Lake does not get as many visitors as the larger lakes in Golden Gate Park, this destination provides a nice place to relax without the distractions of crowds – even on the weekends. For instance, just east of the lake, you’ll find a cozy hideaway upon entering the park at the intersection of Martin Luther King Jr. Drive and Transverse Drive – just west of 19th Avenue. After walking about 200 yards up Transverse Drive, start exploring on your left, where a large dirt path awaits. Smaller paths, evergreen trees, and other natural features offer additional chances to take in the variety of landscape. Bird watchers may come in the wintertime to find Lincoln Sparrows and other feathered creatures lying in the brush and grasses along the northern edge of the lake. Ducks also enjoy frequenting the lake when water levels are satisfying. Other flying passersby may include Ring-neck, Ruddies, American Wigeons, Mallards, Buffleheads, and Belted Kingfishers. Hotspots by the lake to see wildlife include the fruit tree located on the north shore of the lake, the eucalyptus just north of the lake, and the weed patch situated by the east end of the lake. The blossoming of plum and cherry trees on the east side of Elk Glen Lake are quite the sight to see. In the early spring, you can only imagine what hides in the wild grasses that grow tall during this time of the year. Elk Glen Lake is located at the foot of the 25th Avenue entrance and Martin Luther King Drive.